Wynne doesn’t see himself as a “glass artist” but it is the work he has become most widely known for. By Sandra Schulman, WPB Magazine Arts & Entertainment writer, Music and Film Producer. 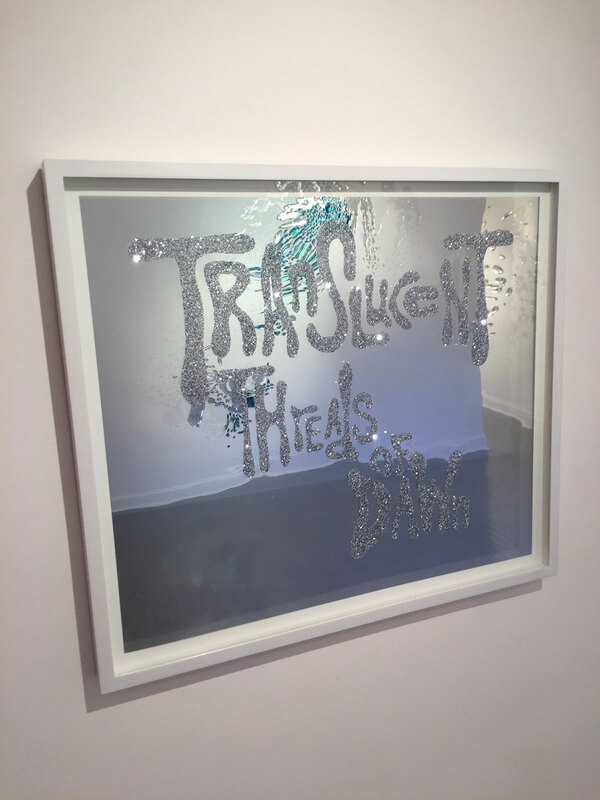 The glam rock lover in me has never been happier than I was standing in a gallery full of Rob Wynne’s glass, mirror, glitter, mylar based work at his solo show at Gavlak Gallery in Palm Beach. 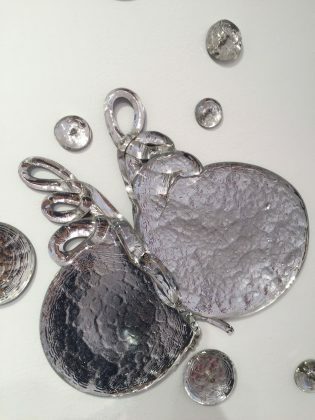 Silvery and metallic and gleaming, his hand poured molten glass works drip and splatter and melt off the walls, evoking a watery respite from the brick and mortar world. 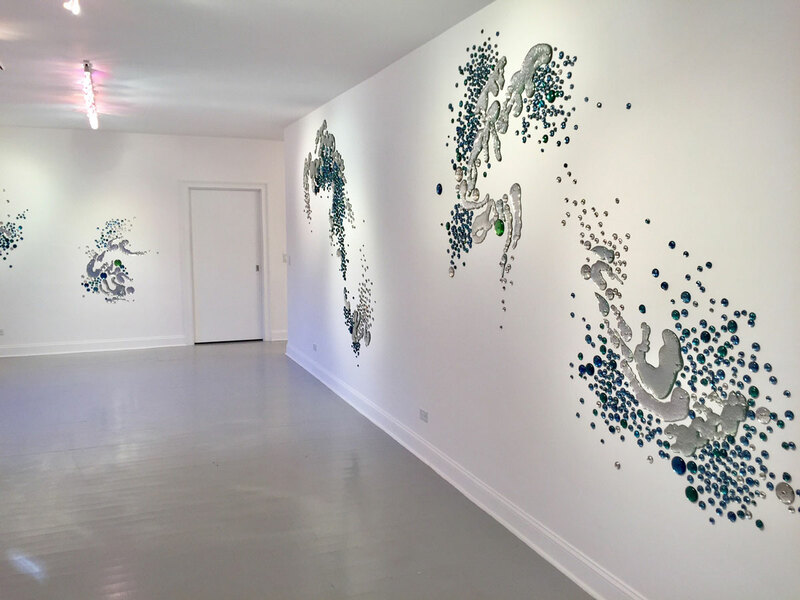 The show is called OH2/H2O, invoking water and mirrors and reflections, this is his third show at the Palm Beach location and his fourth with Gavlak Gallery. The gallery touts his work as “embodying the Rococo style of asymmetrical forms, elaborate ornamentation, and Enlightenment sensibility of the 18th Century, combined with contemporary and unexpected use of text and materials.” Rob Wynne himself says he was immersed in Japanese art and ways to portray water. From that Wynne went on to experiment with hand pouring the molten glass to shape puddles and letters and forms like butterflies. Then he created whole wall installations with them by first arranging them on the floor and creating a template to recreate them on the wall. Each piece, and some works have over 800 individual pieces of glass in them, gets coated on the back with silver nitrate at a mirror shop, then drilled with a hole so a screw can be inserted, then it’s numbered according to the template. It’s an exhaustive multi-step process that can take three months to complete one piece from start to finish. Rob Wynne doesn’t see himself as a “glass artist” but it is the work he has become most widely known for. 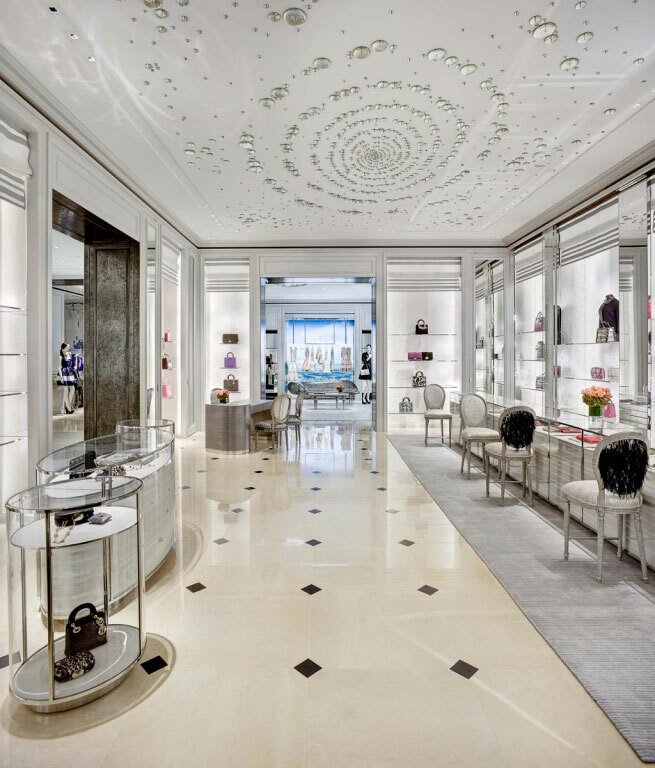 He did a collaboration with uber architect Peter Marino of haute couture Christian Dior stores worldwide with Wynne’s glass works dappled across walls, mirrors and ceilings. 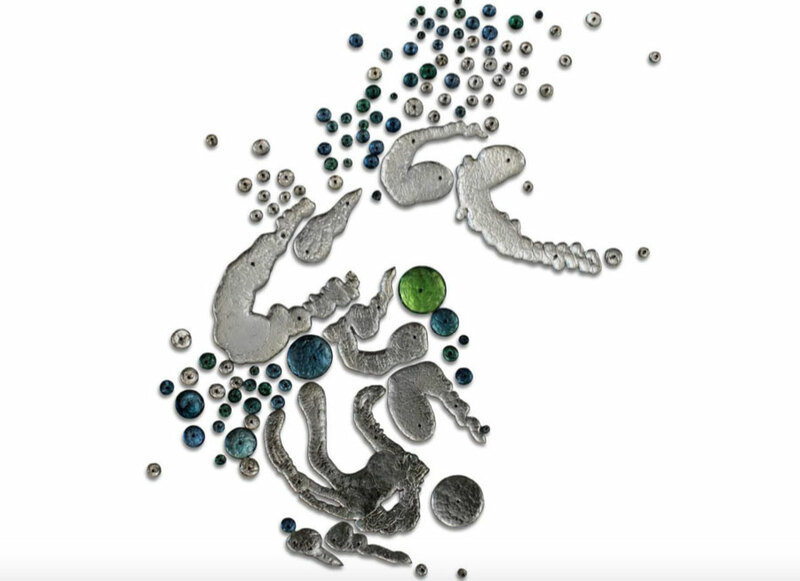 His current exhibition features words and phrases from Wallace Stevens, Baudelaire, and Rimbaud, in combination with mirrored curves, serpentines and spiral forms of glass. Text works have titles The Sound of Water, Atmosphere, and Translucent Threads of Dawn which aim to disrupt the barriers of the senses. To get away from the hazmat suits of glass work, he is also exhibiting delicate hand-beaded drawings on vellum, each of which can take 50 hours to complete. The beaded embroidery of butterflies trail webs of threads behind the transparent paper it is attached to, offering more layers of intricacy. His new glitter paintings on silver mylar are definitely reflective, as the words Frenzy or Romance force you to see yourself in them. Rob Wynne has had numerous solo gallery exhibitions, including Galerie Mitterrand, Paris, France (2016); The Norton Museum of Art, West Palm Beach, FL (2012); and Locks Gallery, Philadelphia, PA (2011). His work has been featured in Museum of Modern Art, New York, the Museum of Fine Arts, Boston, MA (1990). Wynne’s work is in the collections of the Whitney Museum of Art, New York; The Museum of Modern Art, New York; Philadelphia Museum of Art, Pennsylvania; Centre Pompidou, France; The Norton Museum of Art, Florida; and the Bibliotheque Nationale de France, Paris.